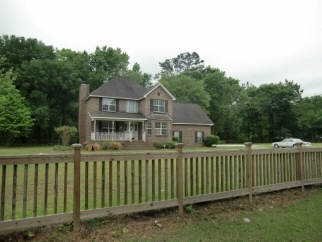 Custom built home situated on 2.5 acres, mostly fenced. Brick home features gleaming hardwood floors, wood burning fireplace in family room, full front porch with, screened back porch, dining room with bay window. Kitchen features granite counter tops, white cabinetry with glass panels and tile flooring. Upstairs is large multi-purpose room over garage, three bedrooms, two baths. Large master bedroom features sitting area, master bath with dual vanities, large soaking tub, separate shower, and large walk-in closet. Large screen porch overlooks tranquil back yard with oak trees, and a small pond beyond fenced area. Experience nature everyday in your own yard with a variety of birds in this horse friendly neighborhood. Just 15 minutes to I-526, yet private and spacious.